Provide a place of Worship where people actively gather to practice their authentic Orthodox Christian Faith to impact the world and lead people to the Kingdom of God. HOLY TRANSFIGURATION GREEK ORTHODOX CHURCH INC accepts donations. Donate Now. 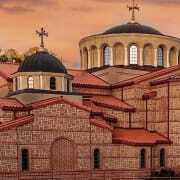 Would you recommend HOLY TRANSFIGURATION GREEK ORTHODOX CHURCH INC?